Last February, during my first solo trip to London, I brought Ken Follett’s The Pillars of the Earth to accompany my 8-hour flight. With its golden cover and “Oprah’s Book Club” sticker on the front, I brought the book thinking I’ll be engrossed into a great historical novel for the entire duration of my flight. Unfortunately, I never opened the book. After returning home, the book found a place on my bookshelf, where it stayed until a month ago, when I was searching for a great summer read for those lazy days on the deck steps (I used to have a hammock but it got destroyed during a summer storm). My verdict? What a book. What a story. I got so absorbed into the plot and characters that in a book of 900+ pages, I read about 500 in one day. I just couldn’t put the book down. If you haven’t read it or heard of it (impossible, I say! ), The Pillars of the Earth tells the tale of a Tom Builder and his family as they struggle to survive during the harsh realities of life in twelfth century England, mainly in a fictional town of Kingsbridge. Tom Builder’s dream is to become the master builder of a cathedral, a dream that more often than not leads him to disappointed and tragedy. The epic story also follows the ambitions and greed of several monks and bishops, including the Prior Phillip, who eventually employs Tom, the earls of Shiring and their lust for power, and the general struggles for survival faced by many of the main characters. It is a story of dreams, hopes, greed, love, ambition, and tragedy. And it includes many accurate historical details, including the development of Gothic architecture in England and the assassination of Thomas Becket. 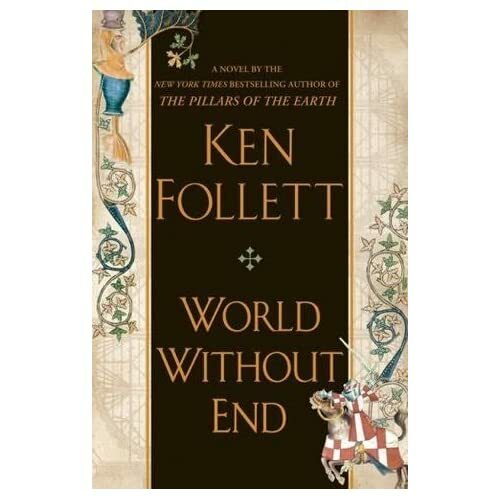 I enjoyed The Pillars of the Earth so much that before even reaching the halfway point, I ran out to Indigo to buy the sequel, World Without End. It doesn’t have the same captivation of its predecessor, but Follett brings the same brilliance to the table. I’m still reading it, but so far, so good!